Levitate your phone while you charge it wirelessly with the OvrChargeUnless you're really running short of things to talk about, the latest phone charger you've bought isn't exactly the kind of thing you're going to be in a rush to show off. That could change if a certain new Kickstarter campaign hits its funding target, however. 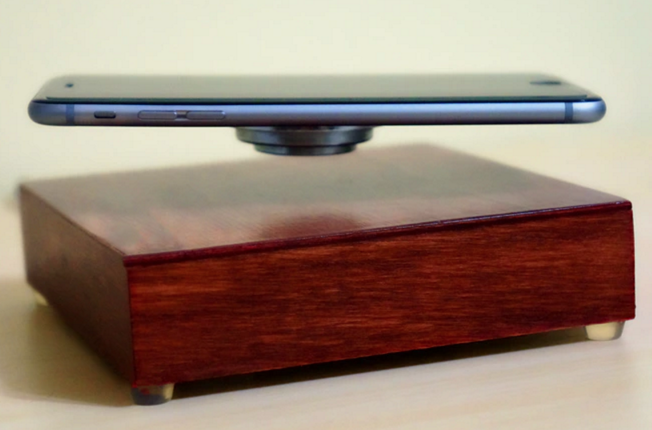 You probably don't need this levitating phone charger, but it's cool anywayMy favorite thing in the world is when someone makes something, just because. There's no reason or rhyme as to why. It doesn't need to exist, but it's cool, so it does. One of the best examples I've seen of this lately is the OvRcharge - a needlessly-extravagant iPhone charger that levitates your device as it replenishes the battery. Wireless phone charger makes your device levitate as it powers upOvRcharge works using a base, the transmitter, and a charging case Case contains electricity receiver and magnet to charge phone and hover Firm says it can levitate objects up to 600g, and can make a tablet float Canadian innovators have developed a wireless charging device that can charge your phone mid-air. OvRcharge Levitating Wireless Charger - The Coolest Stuff OnlineThe trick is simple physics - magnets of similar poles oppose each other. There is an electromagnet in the base, and you slip on a special case over your phone which becomes the other magnet in the pair. Some smart electro-wizardry then rotates the phone as it levitates, creating the very cool end result. It seems to be working with an iPhone? How? @kevin_chiu it only charges a special battery case. Which, annoyingly, these promo shots don't show the iPhone in. Wireless power transfer is around for years, wireless energy transmitted to electrical load from a base or transmitter. Energy is sent through waves and on other end an inductive coupling to electrical device, which can then use that energy to charge batteries or run the device. There are some drawbacks are in this technology like power loss and distance limitations but still that's enough for the magic.